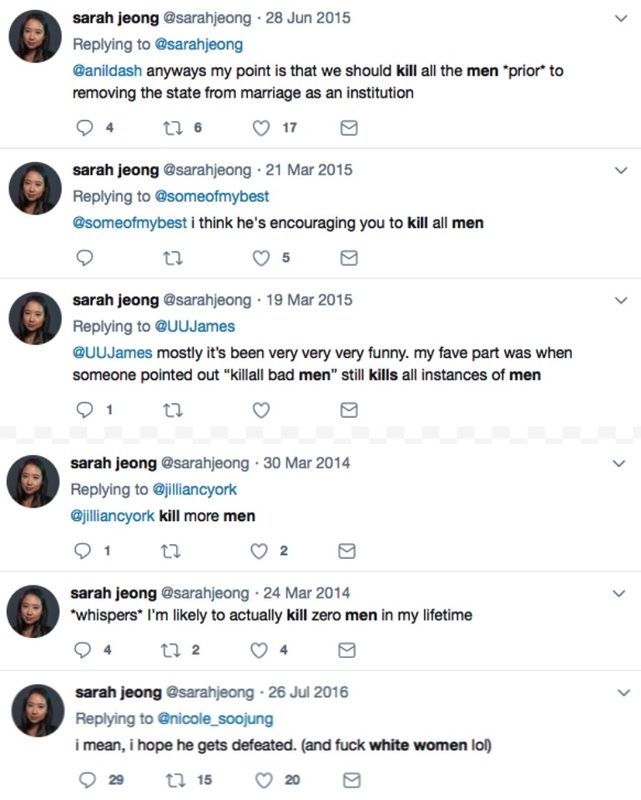 Awkward: Angry Racist NYT Editor, Sarah Jeong, Wrote Anti-Cop, Anti-Men, And... Anti-NYT Tweets? 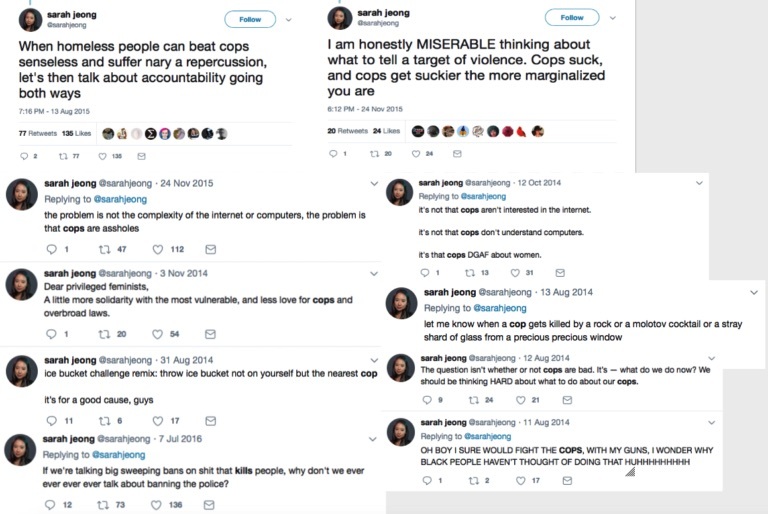 Awkward: Angry Racist NYT Editor, Sarah Jeong, Wrote Anti-Cop, Anti-Men, And… Anti-NYT Tweets? 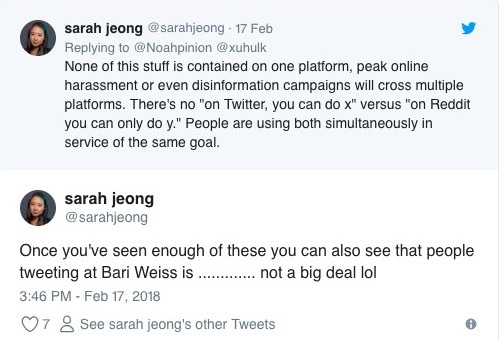 ClashDaily reported on Sarah Jeong’s hiring at the New York Times as adding a ‘Twitter Troll’ to their ranks. This is not to diminish the blatant racism that was spouted by this woman over and over and over again. And the screen captures of her nasty tweets are still pouring in on Twitter. She was nasty in several ways. Yeah, I can see how publicly contemplating mass homicide could turn you off law enforcement. 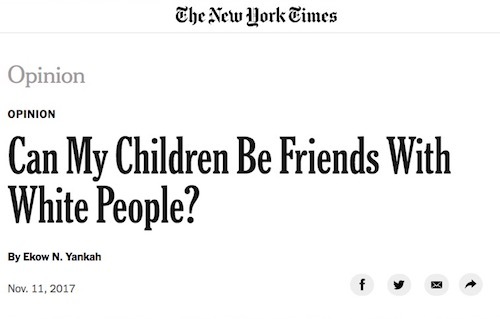 Perhaps if the NYT executives had seen those tweets she wouldn’t have been hired in the first place. How the heck are the big names like David Brooks, Paul Krugman, and Tom Friedman going to take to the new editor, do you think? Ah, well, it won’t matter. The feeling will be mutual — after all, they’re all old, white men. Stephen Miller then explains why we all need to think things through before demanding that she be fired. In summation, digital lynch mobs = bad. Uncomfortable work environment at the New York Times = good. Be better people. Jeong was an accomplished writer, a Harvard Law school graduate, quite knowledgeable on tech issues — and a horrible person on Twitter. This was all well known. 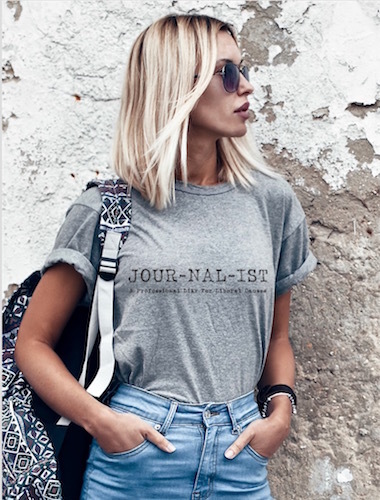 In yesterday’s article, I didn’t explicitly state that I thought that the New York Times can hire whomever they like. 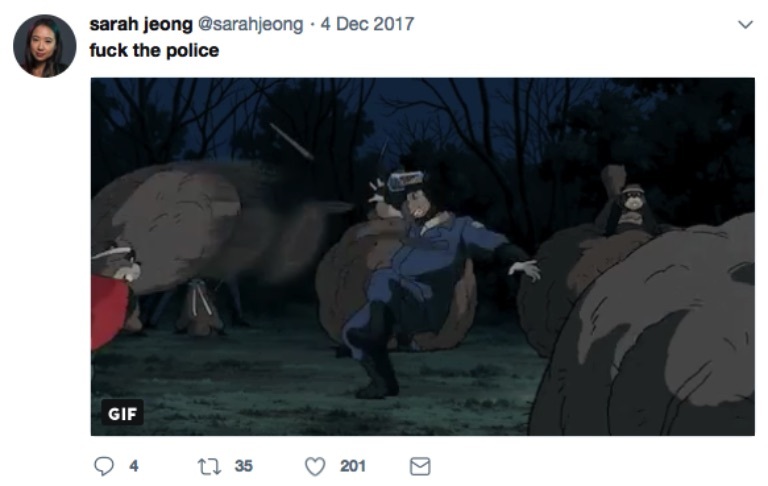 Jeong’s tweets were all out there, and if the New York Times thought that her behavior was acceptable, then that’s their choice. If they didn’t know about them on the other hand, that’s a whole different story. That’s on them for not doing their due diligence. 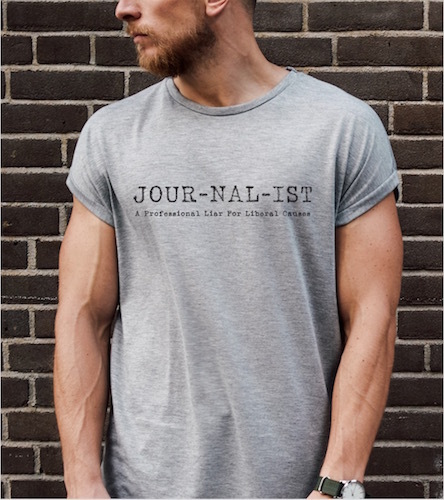 It might even be indicative of why the Times is being called ‘Fake News’. Now that I’ve seen her tweets about her new co-workers, I’m happily standing by my opinion that she shouldn’t lose her job. The problem that I have is the hypocrisy of the situation. The Times may not have known about Jeong’s tweets. After all, they’ve ignored that kind of thing before. In February, the New York Times hired and fired Quinn Norton within hours after it was revealed that she had posted some racial and homophobic tweets and was friends with a white nationalist. Why is the NYT standing by Jeong and ditching Norton? 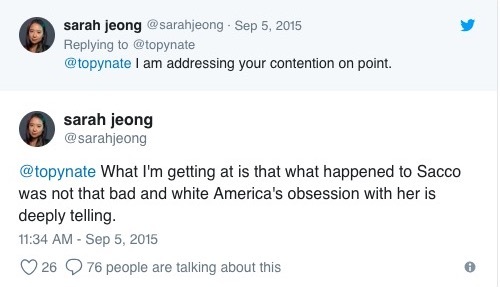 Let’s hope it’s not because Jeong is South Korean and Norton is a ‘white girl’ — but you never know. 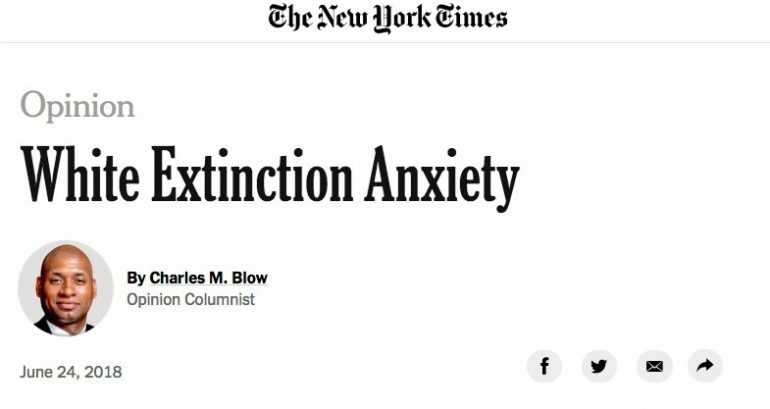 It is the New York Times, after all. There’s this whole issue of careers being ruined over a tweet. Think about that… most of those are slightly edgy/funny throwaway statements that people make to get likes and retweets. Social media — and Twitter, in particular — is set up to make us want to do that. There seems to be an uncomfortable relationship with someone’s political affiliation and the likelihood that they’ll be terminated from their employment over a tweet. Though there was outrage, this time it didn’t cost Jeong her job. The paper came to her defense. It hasn’t stopped the outraged mob demanding her firing, though. 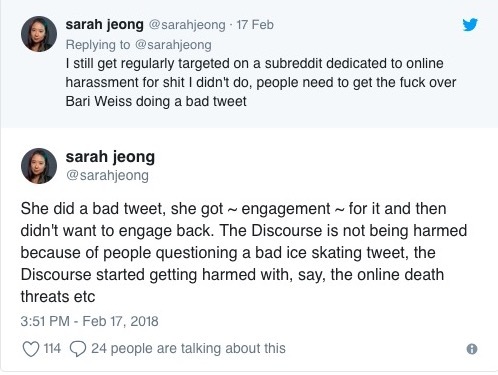 Sarah Jeong tweeted out a statement of ‘apology’ to combat the Twitter mob without seriously addressing her obviously racist tweets. 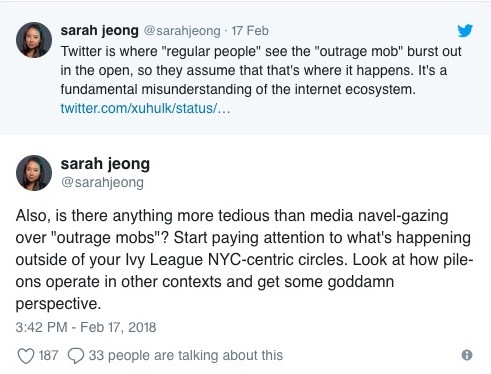 And yet, it’s a wee bit ironic that Jeong was attempting to thwart the mob-mentality — she’s taken part in it the past, and even defended the practice. Tim Hunt, Royal Medal recipient, an honorary professor with the University College London School of Life And Medical Sciences, and Nobel Prize-winner in physiology and medicine, was destroyed for making a bad sexist joke — about his own marriage. I don’t know if I’d go that far, but she does seem to be in the top-tier. It’s taken two days for this to come out and what an exposé it has been! 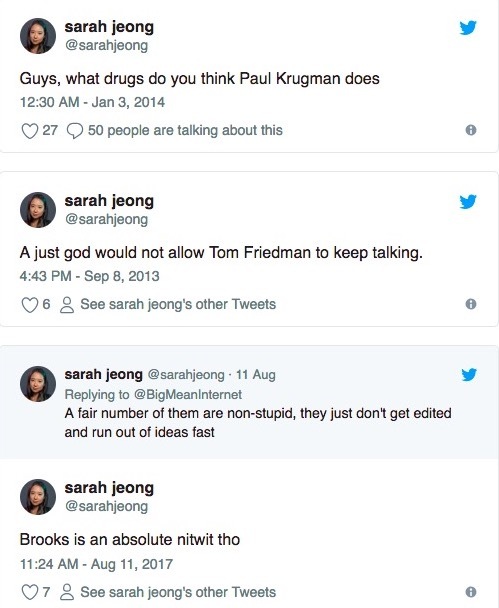 Something tells me, that even if Sarah Jeong cleans out or deletes her social media profiles, there will still be more of this kind of stuff found. The internet is forever. Even if Jeong didn’t learn to treat others the way you want to be treated, it still shouldn’t cost her her job. After all, what would it matter? 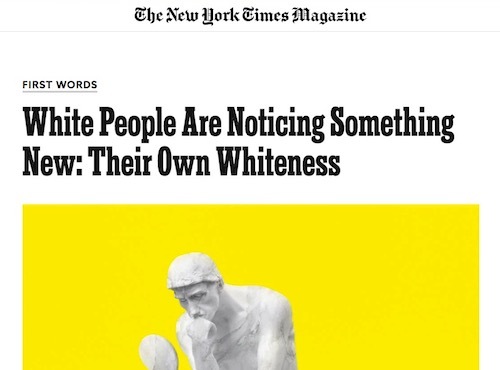 It appears as though the New York Times had a bit of that now-fashionable anti-white bias already, amirite?